TNR -- TV News and Reviews: The Event Pilot : "I Haven't Told You Everything"
Okay, I have to admit, I was pleasantly blown away by elements of tonight's pilot episode of The Event: "I Haven't Told You Everything". In today's world of spoilers and commercials that give away too much, it was nice to know I had some preconceptions of the plot that turned out to be completely wrong. There was one out-and-out gasp moment and the big end surprise which I had a suspicion of only slightly before it actually happened. Despite some irritating flaws in character development, all in all, The Event pilot made for good, dramatic TV. My reservation about The Event pilot early on was in Jason Ritter, who plays Sean Walker, a man who hijacks a plane for reasons other than the ones we initially suspect. Ritter is paired up with fresh-faced beach beauty Leila Buchanan (actress Sarah Roemer), and something about that pairing just felt off to me. Though only four years apart, my immediate impression was that Roemer was way younger than Ritter. I suspect Ritter is supposed to be playing a younger character than his real life 30 years of age, so they gave him some college boy facial hair to try and make him seem like a casual free spirit type--but oddly, Ritter looks a lot younger without the scruffiness. *SPOILER ALERT* It was a relief as the plot of The Event pilot progressed, and Ritter and Roemer got some more time to develop their characters. As we got another view of Leila's family and another angle on the story, I started to care more about the fate of the characters as well. Once the action heated up on the plane, and in the flashback when Leila goes missing, Ritter also seemed to hit his stride on the dramatic level. It may just be a lack of chemistry between the actors throwing off the earlier scenes, which is a problem when it's an extremely important relationship in the plot of The Event. Also difficult to overlook in The Event pilot were some boneheaded moves by the characters. After diving off a cliff into the ocean and saving a drowning woman's life, Sean ends up spending his romantic cruise with Leila as a foursome with the woman and her boyfriend. Leila and Sean justifiably find the couple a little creepy, but Sean still decides to go snorkeling with the woman--without his girlfriend or her boyfriend. Who would do that? He's getting ready to propose to the woman he loves on a love boat, and so he spends the morning with some strange woman he met on the beach? I don't think so. Even more boneheaded is Leila's parents at home. A big point in the plot is that Leila's parents are overprotective, and keep phoning her on her trip to check on her and what she's doing. Then they send their 7 year old daughter outside in the driving rain--without a coat--to retrieve her bicycle, and they don't accompany her or even watch her out of the window. Who is writing this stuff? It was also a bit annoying to watch The Event pilot scene where the President (Blair Underwood), his family, and all of the Secret Service sit and stare at an airplane barreling towards them instead of trying to get the hell out of there. While I can buy being paralyzed by fear for some of the characters, I have to think that at least one of the agents would be shoving the President into the car and at least attempting to peel out of the driveway at 200mph. That said, the mystery elements of The Event pilot were intriguing, and I liked the way that shifting the point of view and replaying an earlier scene created all sorts of cool revelations. It was a surprise to realize Sean wasn't a crazy hijacker, but someone who was actually trying to save everyone on the plane. My big gasp moment came when we discovered that murderous pilot behind the locked door was actually Leila's father--no doubt coerced with threats against his family. I'm also curious about the secret facility with detained folks working in labs, who have a "leader" in Sophia (ER's Laura Innes). Sophia knows more than she's telling, hence The Event's pilot title: "I Haven't Told You Everything". As Sophia and the President and everyone else stood and watched the plane on its death run, I suddenly suspected something Dramatic was about to happen. Though I don't think I was prepared for the plane vanishing into some sort of time warp/shift/black hole/vortex. Pretty cool stuff. Questions about The Event abound now, which is a good way of getting us to tune in to the next episode. Where is the plane, and who saved the people on the ground? Who kidnapped (or killed) Leila, and is the rest of her family alive? What was the point of wiping Sean and Leila's existence from the cruise merely for a kidnapping? Were they hoping to take Sean out of play as well? And, of course, what is "The Event" that Sophia mentioned? The Event has an intriguing premise, but I think it will have to keep up the spectacular surprises to keep me on board. I'm feeling gun-shy after elaborate serials like Battlestar Galactica and Lost failed to answer all of those cool questions they asked along the way. It's not enough to set up mind-boggling mysteries--you've got to include a payoff. Word is that The Event will give us some big answers next week. Hopefully the answers will make us want to tune in again, rather than tune out. The Event airs on Mondays, at 9/8c on NBC. 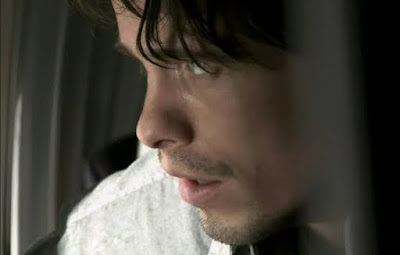 PHOTO: Jason Ritter as Sean Walker in "I Haven't Told You Everything", The Event pilot screencap c2010 NBC.